Which fences work with which pet proofing barriers? 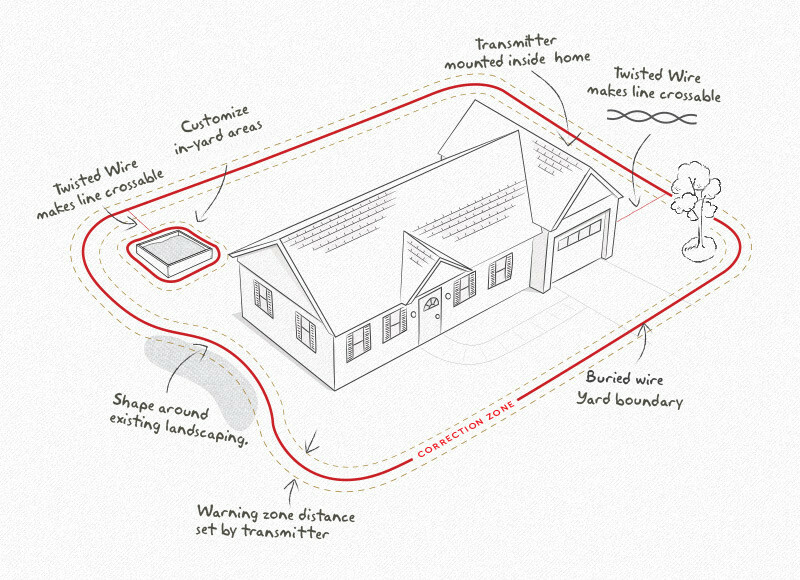 If you already have a PetSafe in-ground fence, you can use the same collar with our pet proofing barriers. Purchase an extra barrier and place it in an area you don't want your pet to access. Choose from indoor and outdoor barriers. Wireless fences aren't compatible with our pet proofing barriers. Can I attach a leash to the containment receiver collar? No. This can result in pulling the contact points too tightly against your pets neck. Attach a leash to a separate, non-metallic collar positioned above the receiver collar. Can I use the containment system on a cat? Yes, the system can be used as long as the cat can comfortably wear the receiver collar. We also offer a special in-ground receiver collar just for cats (not compatible with wireless systems). Can I use the system on an aggressive dog? Yes, the receiver can be place on any non-metallic strap. However, you must be able and willing to “punch” two holes in your pet's current collar so that the contact points can be properly inserted. Be advised; do not attach a leash to a collar that has a receiver on it. This can cause additional pressure on your pets neck through the contact points in the collar. Never leave the receiver collar on your pet for more than 12 consecutive hours and remove the receiver collar from your pet when indoors for the comfort of your pet. Always follow the instructions in your product manual. Never connect a lead/leash to the electronic collar; it will cause excessive pressure on the contact points within the collar. For best results, your pet should be 4 to 6 months old and know basic commands such as sit and stay. Is there a hand-held remote transmitter that will work with the system? No. You would need to purchase a separate remote training system. Please browse our site or contact our Customer Care Center for more information. Hold the test light to the receiver collar contacts at your pet’s neck height and walk out into your yard. 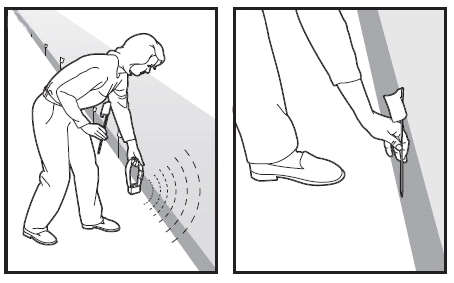 Walk towards the warning zone until the receiver collar beeps and the test light tool illuminates. Repeat this process around your yard, placing flags every 10 feet until the containment yard is fully marked with flags. Note: the higher the level of correction of the receiver collar, the brighter the light with flash. If you cannot see the light flash, increase the level of correction of the collar. Will static correction harm my pet? The static correction is safe and harmless. It is effective enough to get your pet’s attention. The correction produces less energy than that produced by a static shock from carpeting. Will this fence keep other pets out of my yard? No. Electronic fencing is only effective on pets who wear the Receiver Collar. Other animals can still enter your yard. How do I lay out my system? 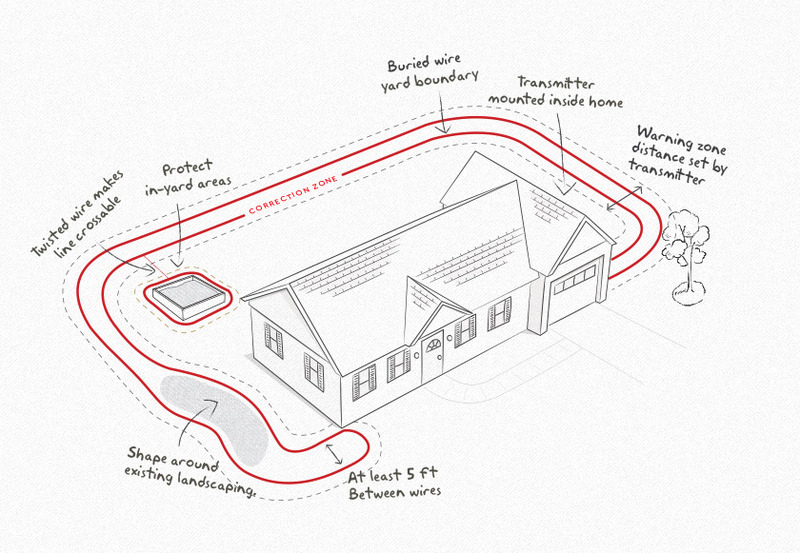 With the Single Loop layout, you'll bury one continuous wire around your entire yard. You can also use this layout to keep your dog out of your garden or pool. 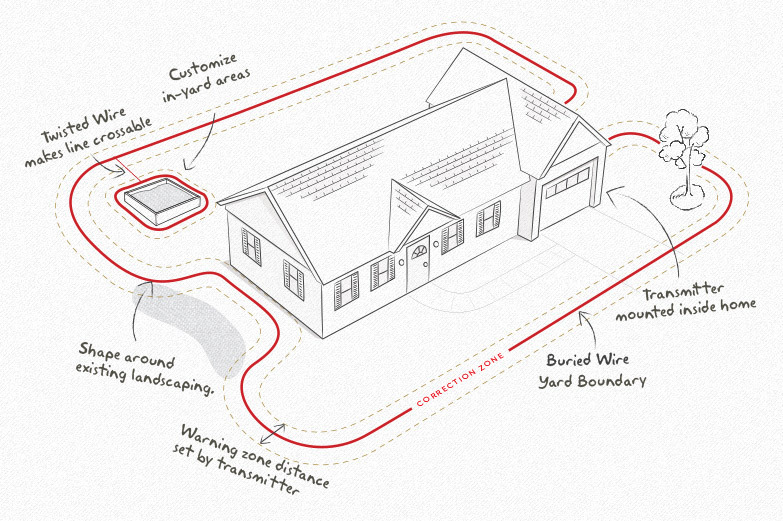 The Double Loop Layout lets you create a boundary for part of your property. This is a great way to give your dog access to the back or front yard only. For a waterfront property, the Double Loop layout can give your dog access to the yard and dock. The Hourglass Loop keeps your pet in the front yard and back yard only, keeping your pet away from the sides of your home. This is also a great option for narrow lots. You can also use your in-ground fence in a yard with a traditional fence. Use the Double Loop layout with a partially fenced yard. With a fully fenced yard, use a Single Loop layout and attach the wires to the fence instead of burying them. Yes. There is no limit to the number of pets you can contain with the containment system. It’s as simple as purchasing an additional compatible receiver collar for each pet. You can purchase additional receiver collars online or contact our Customer Care Center. Once my pet is trained to respect the yard boundaries, how do I bring my pet into and out of the yard? Once your pet learns the Boundary Zone, he will be reluctant to cross it for walks or car rides. You may need to convince your pet to leave the Pet Area with treats and praise. Before you take your pet across the Boundary Zone, remove the Receiver Collar. Make sure your pet is wearing his standard collar and attach a leash to the collar. There are 3 ways to take your pet outside the Boundary Zone. If you're going for a drive together and your car is in the Pet Area, you can put your pet in the car and drive him out of the Pet Area. You can also walk your pet out of the Pet Area. 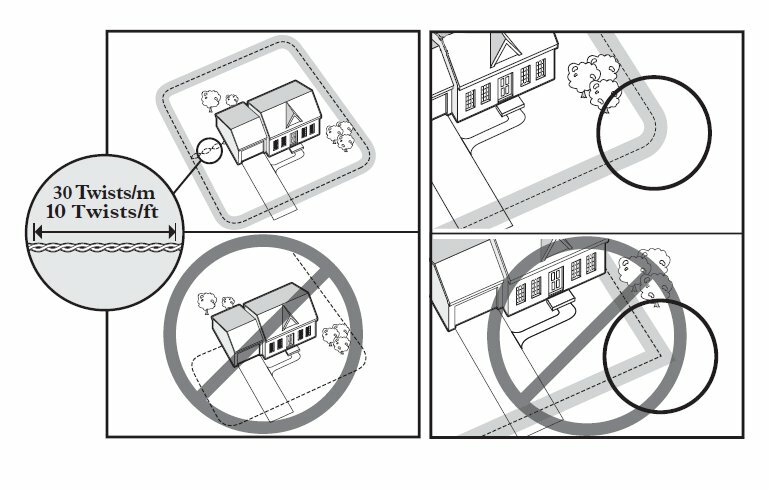 Give a command such as “OK” at a specific place of the Boundary Zone, such as the end of your driveway or sidewalk. Always leave the Pet Area with a leash at this place and your pet will associate leaving the Pet Area only on a leash, only at this place, and only with a person. You may also carry your pet out of the Pet Area. Use our Wire Calculator to figure out how much wire you need for your in-ground fence layout. How long will it take me to install an In-Ground Fence™ System? This is dependent on the layout you have planned, soil conditions, the tools you are using, amount of wire buried, etc. The majority of the time involved in installing your system is in burying the wire. This is typically considered a weekend project; it can be completed in about a day. It's very helpful to have someone to help you plan, layout, and install the system. Connecting the wires to the transmitter. Strip the wire coating ends of the boundary wire approximately one-half inch, exposing the copper wire. Plug the power adapter into the power jack and a 120-volt outlet. The power light and loop indicator lights should come on. If this does not happen, contact our Customer Care Center. 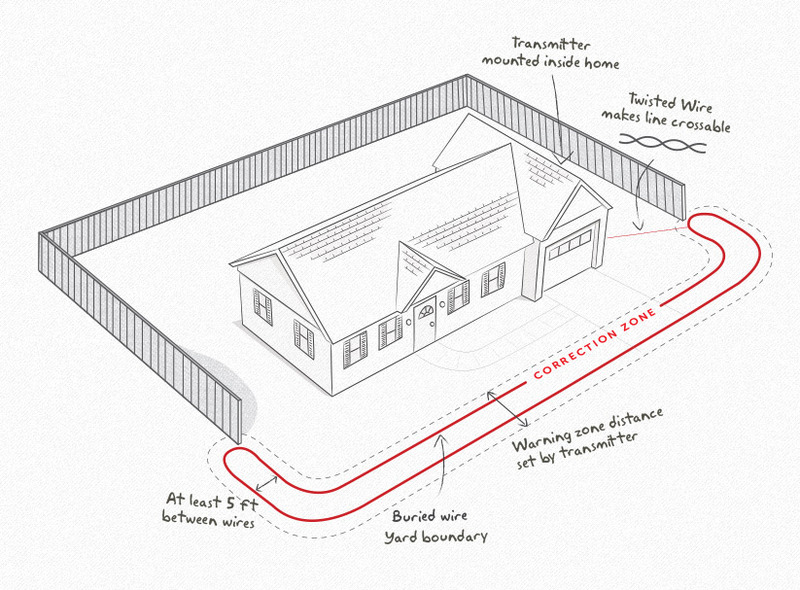 When installing an in-ground fence system, lay out the boundary wire around your property. Use your proposed boundary and test the system before burying the wire. This will give you freedom to adjust your wire layout if you need to. If you must cross underground utilities or buried cables with the boundary wire, do so at a 90-degree angle (perpendicularly). If you have a neighbor with a containment system, keep the boundary wires of your systems at least 5 feet apart. It may help to talk to your neighbor about the location of their boundary wire in their yard. If separating the wire by at least 5 feet from a neighboring containment systems wire does not reduce the inconsistent signal, contact our Customer Care Center. Twisting the boundary wire cancels the signal and allows your pet to cross over that area without receiving a static correction. When twisting wire, you must be twisting wire that completes the radio signal circuit. This means, there is a wire leading from the transmitter and the wire goes around your yard and returns to the transmitter. You must be twisting portions of the leading and returning wires together in order to cancel the signal in that area. Plastic or metal piping will not cancel the signal. Twist the boundary wire 8 to 10 times per foot to cancel the signal. If you need additional boundary wire to expand your wire loop, you will need to splice the wires together. Since wire breaks tend to occur at splices, it is helpful to note the locations of all splices for future reference. We also recommend that you create waterproof splices using gel-filled splicing caps. These are available for purchase online or by contacting our Customer Care Center. They are also included in current containment systems. Strip approximately one-half inch of insulation off the ends of the boundary wires to be spliced. Make sure the copper boundary wire is not corroded. If the boundary wire is corroded, cut it back to expose clean copper wire. Insert the stripped ends into the wire nut and twist the wire nut around the wires. Pull on the wires to make sure you have a strong splice connection. If you do not have gel-filled caps, apply waterproofing compound (e.g. silicone caulk) in and around the wire nut or wrap the wires and the wire nuts with electrical tape to prevent moisture from corroding the copper. If your splice pulls loose, the entire system will fail. Make sure your splice is secure. Strip the coating of the ends of the boundary wire approximately one-half inch exposing the copper wire. Can I leave the boundary wire above ground or even attach it to an existing fence? You can, but it is not recommended due to the potential for damage to the wire. We do recommend that you bury the wire or place it in a protective casing like a water hose but the system will work with the exposed and wire above ground. The boundary wire is buried so that it is not accidentally tripped over, cut, or damaged. Use care when using a weed eater or when digging near the boundary wire to prevent damage. It can be attached to any fence including a metal fence as long as it is galvanized. When attaching the boundary wire to the fence, becareful not to sever the wire. How do I allow a place along the boundary wire where my pet can safely cross? To create the layout that you need, a double loop layout format will be necessary. First, run the wire around the perimeter. When you get to the end, make a U-turn with your wire and backtrack around the coverage area. Be sure to keep the wire 3 - 5 feet apart where you want signal. When you want to cancel the signal, bring the wires together and twist them 10 times per foot. It may help to you to use landscape staples or half of a small piece of PVC pipe or water hose to protect the wire on either side of the driveway or sidewalk. This will ensure that the wire isn't cut during activities such as weed eating or mowing near the driveway. If you do not wish to cut your driveway and an expansion joint is not an option, you may want to consider using a double loop layout (See: What is the double loop layout and why do I need to do it?). You may also want to reconsider your layout and avoid the driveway as a part of your containment area. What are the ABC settings on the transmitter for? There is a switch on the side of your transmitter, it may read "A,B,C" or "High, Low". The settings on the A, B, C switch help to adjust the resistance in your containment perimeter. Use this feature, along with the range dial to adjust the distance from the wire to the point where your pet's receiver collar will activate. Many factors will determine which setting is the best for you (the amount of wire in your layout, interference in your yard and home, your wire layout, etc.). Please try all 3 settings individually to determine which is the best option for your perimeter. A double loop is a type of wire layout which gives you the option to establish a boundary when you do not want to contain your whole property. In the double loop layout, you run the wire from your transmitter and around the yard. Once the wire reaches the opposite side of the yard from the transmitter, the wire needs to make a U-turn and follow the same path at least 5 feet away from itself as it goes back into the transmitter. The goal of phase 1 training is to familiarize your pet with the boundary flags, boundary, tone, and correction. You will introduce your pet to the tone and the static correction and teach your pet where it happens. Put a separate non-metallic collar on your pet’s neck ABOVE the receiver collar and attach a leash. Note: Be sure the extra collar does not put pressure on the contact points. Walking your pet on a leash in the pet area. With the collar on your pet and in the "on" position, walk your pet on a leash in the pet area. When your pet enters the warning zone, the receiver collar will activate and start beeping. As your pet continues past the flags into the static correction zone, he will receive a static correction. Immediately after your pet receives a correction, lead him back into the pet area. Praise him warmly and keep very calm body language. Repeat this process at several different boundary flags. Never pull or call your pet into the static correction zone. Put a separate non-metallic collar on your pet’s neck ABOVE the receiver collar and attach a leash. Note: Be sure the extra collar does not put pressure on the contact points. Create distractions to tempt your pet to enter the warning and static correction zones, such as have a family member cross from inside the pet area to outside of it, throw a ball outside of the pet area, or have a neighbor walk their pet outside of the pet area. Put the collar on your pet and in the "on" position. Walk your pet on a leash toward the boundary flags. Use one of the distraction methods list above. If your pet follows, let him / her feel a correction and quickly lead them back into the pet area and praise them. If your pet does not follow the family member, praise him / her warmly. Have a family member or a neighbor with a dog walk outside the pet area parallel to the boundary flag line. Repeat the interaction with your pet as in step 1. With your pet on a leash, throw a ball outside the boundary flag line. Again, repeat the interaction with your dog as in previous steps. To give your pet free run of the pet area off the leash. Walk around the yard and play with your pet, staying within the pet area at all times. Preoccupy yourself with another task in the yard while watching your pet. Now your pet is ready to run! Check in on your pet at regular intervals. My pet reacts strongly to the static correction and has become fearful. This can happen if the static correction level is too high. It is best to start on the lowest level of correction and increase the levels gradually. To solve your immediate issue, lower the static correction level and reassure your pet and offer praise. Make sure you are in control of the situation when your pet receives his/her first static corrections (have him/her on a leash attached to a separate, non-metallic collar) and lead him into the pet area and praise him/her. If your pet remains fearful, suspend training and start again the next day. Make sure to end all training sessions on a positive note with lots of praise and play. My receiver collar is beeping but my pet is not responding to the static correction. Remove the collar from your pet. Make sure the static correction level on the receiver collar is set at 2 or above. Take the test light tool and place it on the receiver collar and walk out to the boundary of the containment system. Check the fit of the receiver collar on your pet. The collar should fit snuggly and high up on your pet's neck. If your pet has long hair or a thick coat, trim your pet’s fur where the contact points touch the neck and / or you can purchase longer contact points. Please click here for contact information to reach our Customer Care Center. Increase the static correction level. Do this one level at a time, and test each level with your pet until you see your pet recognize the correction. It may also be necessary to repeat the training steps to reinforce training. If the test light tool does not flash, there is an issue with the collar. Please call our Customer Care Center. My loop light is off or my Transmitter is beeping. The loop light goes off and the Transmitter starts beeping when a wire break is detected or when the Boundary Width Control dial is set to "0". To see if the Boundary Width Control is set to "0", open the lid and check the dial. If the Transmitter continues beeping, try a System Test to check to see if your wire is broken. Remove the Receiver Collar from your dog and make sure it is installed with a good battery. Unplug the Power Adapter from the Fence Transmitter Power Jack. Note the current range settings. Set the Range Boundary Control switch to Low. Set the Receiver Collar Static Correction level to highest setting, if applicable. Disconnect the twisted Boundary Wire from the Boundary Wire terminals on the Fence Transmitter by pressing the red release levers on the connector and pulling the wires free. For older Transmitters unscrew the red terminals. Cut approximately 15 feet of unused Boundary Wire, strip 3/8 inch off the ends of both sides, and connect it to the Boundary Wire Terminals. Plug the Power Adapter into Fence Transmitter Power Jack. How do I locate a break in the boundary wire? Check your yard to determine any possible damage to the boundary wire (e.g. recent digging, aerating, rodent burrowing, or any other noticeable disturbance in your yard next to the wire). If you still cannot find the break in the boundary wire, there are 2 options for locating it. Option 1: Purchase a Wire Break Locator that will locate the break in the boundary wire. Watch this video for instructions on using the Wire Break Locator. Option 2: Follow the procedure below. Connect both ends of your twisted wire to one boundary wire terminal. Plug in the fence transmitter and check the loop indicator light. If the loop indicator light is on, you can assume the break is in the other half of the boundary wire. If the loop indicator light did not come on, you may assume there is a break in this portion of the boundary wire. However, there is a small chance of having more than one break in your system. Be sure to check both halves of your entire loop. Replace the damaged boundary wire with new wire. Reconnect the boundary wire to the fence transmitter. Check the loop indicator light. If the loop indicator light is on, test the system with the receiver collar. If you suspect you have a partial wire break, contact our Customer Care Center and we'll be happy to help. How do I repair a damaged wire (splice wires)? Before you begin splicing wire, it will be helpful to you to note the locations of all splices for future reference. If you ever have a wire break, these most often happen at a splice, and it will be helpful to you to be able to find your splices easily if this ever happens. It will also be helpful to make your splices waterproof. Gel-filled splices are included in your original containment system. Additional splice capsules and wire nuts are available for purchase online, by calling the Customer Care Center at 1-866-738-4379, and at most hardware stores. Strip approximately 3⁄8 inch of insulation off the ends of the boundary wires to be spliced. Make sure the copper of the wire is not corroded. If the boundary wire is corroded, cut it back to expose clean copper wire. Insert the stripped ends into the wire nut and twist the wire nut around the wires. Ensure that there is no copper exposed beyond the end of the wire nut. Tie a knot 3 to 4 inches from the wire nut. 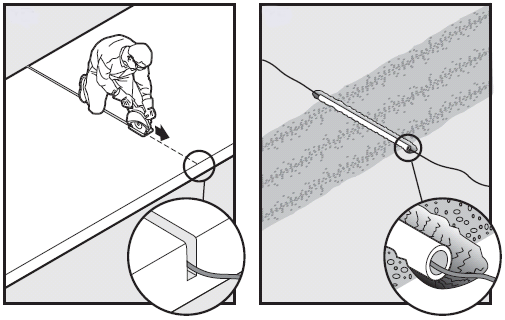 Ensure that the wire nut is secure on the wire splice. Note: If your splice pulls loose, the system will not function. Make sure your splice is secure. This will vary depending on how often your dog tests the boundary. In most cases the battery will last 1 to 3 months and in some cases up to six months. It is important to check the batteries regularly. I just put a new battery in, and the low battery light is flashing on my receiver collar. Take battery out for several minutes. Replace the old battery with a new battery. Make sure battery is installed properly. Recheck the collar. If receiver collar is still flashing, please contact our Customer Care Center to replace the receiver collar. My loop light stays on when a wire is removed from the transmitter. If the boundary dial is turned up to 10, and it is still doing this, contact our Customer Care Center to replace the transmitter. My neighbor’s system is interfering with my system. A neighboring containment system may be causing an inconsistent signal in one or both of your systems. You will need to move the boundary wires of each system away from each other by at least 10 feet. You may need to work with your neighbor to resolve the issue. Make sure the boundary width is at least 12 feet to 20 feet wide. Test the receiver collar with the test light tool, walking toward the boundary wire. If the test light flashes, check the fit of the receiver collar on your pet. If pet is now receiving the correction but still will not stay in the yard, even after reinforcement of training, you may need a stronger receiver collar. We offer a stubborn dog receiver collar with higher correction intensity levels for wireless systems and one for in-ground systems. My power light is on, the loop indicator light is off, and the fence transmitter loop alarm works. Make sure both ends of the boundary wire are plugged into boundary wire terminals and that ½ inch of insulation is stripped so that the copper wire is exposed. Perform the Short Loop Test to determine if the fence transmitter needs to be replaced or if the boundary wire is broken. If the transmitter still beeps / no loop light on Short Loop Test, please contact our Customer Care Center to discuss having unit replaced. If the transmitter is functioning properly on the Short Loop Test, you have a break in your boundary wire. See the “How do I locate a break in the wire?” section. Make sure fence transmitter is at least 3 feet from large metal objects or appliances. Make sure all boundary wire turns are gradual with a 3 foot radius. Make sure the boundary wire is not running parallel to and within 10 feet of electrical wires, neighboring containment systems, telephones wires, television or antenna cables, or satellite dishes. If a neighboring containment system may be causing an inconsistent signal, move the boundary wire further away from the neighboring containment system. If receiver collar continues to activate inconsistently – please contact our Customer Care Center to replace transmitter. My receiver collar is beeping but not correcting. If receiver collar has adjustable correction levels, make sure it is not on level 1. Level 1 is the tone-only setting. Use the test light tool to confirm that the collar is issuing a static correction. If receiver collar continues to not issue correction, please click here for contact information to reach our Customer Care Center for replacement. My receiver collar is not correcting. Take battery out of the collar for several minutes and replace it with new battery. Make sure battery is installed properly. Make sure the tab within the battery housing unit is making good contact. You may need to lift it up if it has gotten mashed down underneath the battery. If the receiver collar has adjustable correction levels, try to change the level to level two or above. If receiver collar still does not activate – remove a wire from the transmitter, try to change the levels. If everything appears to work normally, please contact our Customer Care Center to discuss replacing transmitter. My receiver collar will not change correction levels. Remove the battery for several minutes and replace it with a new battery. Make sure the new battery is installed properly. There is a tab within the battery housing unit that can become depressed over time and may not be making good contact. Lift the tab underneath the battery. If the receiver collar continues to not change correction levels, please contact our Customer Care Center for replacement. My transmitter beeps occasionally, but I can unplug it or turn up the boundary dial to stop the beep. This may mean there is a partial break in the boundary wire. Contact our Customer Care Center for instructions. The fuse blows in my system when it is replaced. The fence transmitter and / or power adapter needs to be replaced. Please contact our Customer Care Center. The lights on the receiver collar will not come on. Remove receiver collar from your pet. Locate the metal tabs in the battery well. Gently lift the tabs to ensure that the battery will make good contact. Replace the battery into the collar. Press collar button and check that the LED light illuminates. The receiver collar has to be held on top of the boundary wire to activate. Begin by replacing the battery in the collar or charging it (for replaceabke batteries only). Next, adjust boundary width control knob clockwise to increase the distance from the boundary wire that the receiver collar activates. You can also adjust the boundary control to another setting. 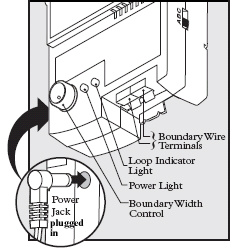 Check the setting of your boundary control switch located on the side of your transmitter and adjust it as needed. Reference the chart below for the appropriate setting for your layout. If using a double loop, make sure boundary wires are separated at least 5 feet. Perform Short Loop Test. If receiver collar activates 6 inches or more from wire, boundary wire has a partial wire break. See “What is a partial wire break and how do I find it?” If the receiver collar still has to be held on top of the boundary wire, please contact our Customer Care Center to replace the transmitter. Turn the boundary width control knob counterclockwise to decrease the distance from the boundary wire that the receiver collar activates. Make sure boundary wires are twisted 10 twists per foot from boundary to the fence transmitter. The transmitter is hot to the touch. Your transmitter may be malfunctioning. Unplug it and contact our Customer Care Center. The transmitter power and loop indicator lights are off. Check that the power adapter is plugged into the fence transmitter. Try plugging the unit into another 120-volt outlet. If the model has fuses in the back, try replacing the fuses. If the lights still do not come on, the fence transmitter and / or power adapter needs to be replaced. Please contact our Customer Care Center. If Surge Protector is installed, unplug the Surge Protector and plug the Power Adapter directly into the outlet. If the transmitter operates without the Surge Protector, contact the Customer Care Center for a replacement Surge Protector. What gauge of wire can I use? The boundary wire you use must be copper and insulated, and can be between 14-20 gauge. The smaller the gauge number, the bigger the wire. You can determine the gauge and type of wire by the color of the insulation. You can mix stranded and solid wire by splicing them together. You can also mix two different gauges as long as they are just one gauge apart. For example, you can splice together 18 and 20 gauge wire, but not 16 and 20 gauge. However, the containment area will only be as strong as the smallest gauge of wire, so the total boundary area may vary slightly. Strip about 3/8”of insulation from each end of the wire. Insert the stripped ends of the wire into the wire nut and twist. Tie a knot 3-4 inches from the wire nut. Insert the wire nut as deep as possible into the gel inside the capsule. What is a partial wire break and how do I find it? A partial wire break is when the wire is not completely broken into 2 pieces, but there is enough damage to cause problems in the system. Partial wire breaks can be more difficult to locate and fix. What is the Short Loop Test and how is it done? The short loop test or system test is a simple test to determine if each component (fence transmitter, receiver collar, and boundary wire) is functioning properly. You'll need a piece of boundary wire at least 15 feet long. Write down the settings for your boundary control switch, boundary width control knob, and receiver collar before starting the test. Remove the receive collar from your pet. Make sure the battery is still good. Set the receiver collar correction level to 5. Disconnect the twisted boundary wire from the boundary wire terminals on the transmitter by pressing the red release levers on the connector and pulling the wires free. Insert the two ends of the test loop wire into the two boundary wire terminals on the transmitter. Lay test wire in a loop. Place the test light tool contacts on the contact points of the receiver collar. While holding the receiver collar with the test light tool in place, approach the wire from outside the loop, holding the collar 2 inches off the ground. Note the distance where the receiver collar activates from the wire. Keep boundary width control knob position at 10. Set the boundary control switch to A. Approach the loop with the receiver collar as in Step 7 and verify the receiver collar activates. Keep the boundary width control knob position at 10. Set the boundary control switch to C. Approach the loop with the receiver collar as in Step 7 and verify the receiver collar activates. When testing is complete, return the boundary control switch and the boundary width control setting to the original positions noted earlier. Remove the test loop wire. Reconnect the twisted boundary wire from the boundary wire terminals on the transmitter by pressing the red release levers on the connector and inserting the wires. Repeat the boundary width testing from Step 6 until you achieve the desired boundary width of 12-20 feet. 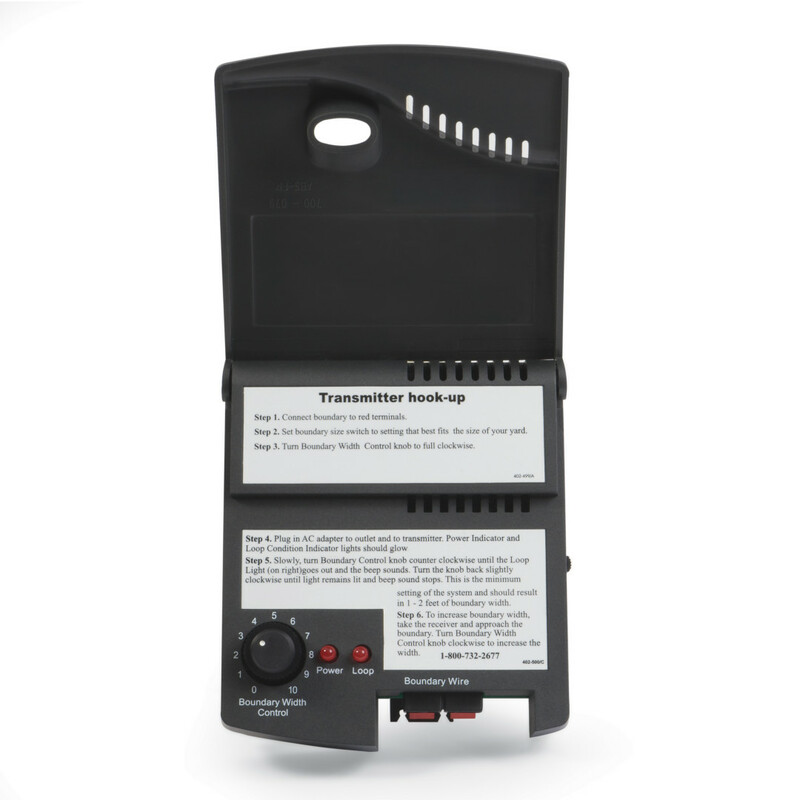 If the power light or the loop indicator light are not both lit on the transmitter, or the alarm is on for any of the above tests, there is a problem with the transmitter. Contact the Customer Care Center. If both the power and loop indicator lights are on, but the receiver collar does not activate on the test loop wire, the receiver collar is not working. Contact the Customer Care Center. If the transmitter power and loop indicator lights are on in each of the 3 boundary control switch positions, and the receiver collar is activating at different distances on the test loop wire, the problem is most likely in the containment boundary wire. Perform the wire break location test to find and correct the wire break in your boundary wire. NOTE: Please note that some partial breaks do not cause the loop light to go out or the break alarm to activate, but can affect the signal. Be sure to check all splices, as many breaks in the wire occur in the area of the splices. When checking splices, look for any moisture or corrosion due to water getting to the wire.